In 1976, Texas Instruments came out with the TL084, a four JFET op-amp IC each with similar circuitry to Fairchild’s very popular single op-amp 741. But even though the 741 has been covered in detailed, when [Ken Shirriff] focused his microscope on a TL084, he found some very interesting things. To avoid using acid to get at the die, he instead found a ceramic packaged TL084 and pried off the cover. The first things he saw were four stabilizing capacitors, by far the largest structures on the die and visible to the naked eye. When he peered into his microscope he next saw butterfly shapes which turned out to be pairs of input JFETs. The wide strips are the gates and the narrower strip surrounded by each gate is the source. The drain is the narrow strip surrounding each gate. Why arrange four JFETs like this? It’s possible to have temperature gradients in the IC, one side being hotter than the other. These gradients can affect the JFET’s characteristics, unbalancing the inputs. Look closely at the way the JFETs are connected and you’ll see that the top-left one is connected to the bottom-right one, and similarly for the other two. This diagonal cross-connecting cancels out any negative effects. [Ken’s] analysis in his article doesn’t stop there though. Not only does he talk more about these JFETs but he goes over the rest of the die too. It’s well worth the read, as is his write-up about the 741 which we’ve also covered. [Keystone Science] recently posted a video about building a theremin — you know, the instrument that makes those strange whistles when you move your hands around it. The circuit is pretty simple (and borrowed) but we liked the way the video explains the theory and even dives into some of the math behind resonant frequencies. The circuit uses two FETs for the oscillators. 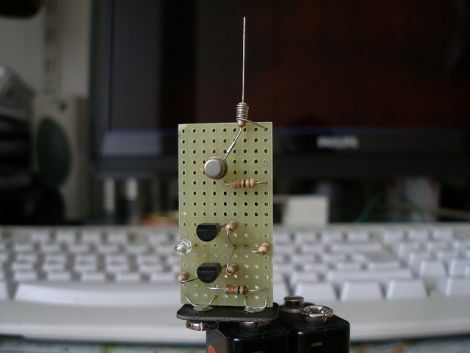 An LM386 amplifier (a Hackaday favorite) drives a speaker so you can use the instrument without external equipment. The initial build is on a breadboard, but the final build is on a PCB and has a case. CMOS opened the door for many if not most of the properties needed for today’s highly integrated circuits and low power portable and mobile devices. This really couldn’t happen until the speeds and current drive capabilities of CMOS caught up to the other technologies, but catch up they did. Nowadays CMOS Small Scale Integration (SSI) logic families, I.E. the gates used in external logic, offer very fast speeds and high current drive capability as well as supporting the low voltages found in modern designs. Likewise the Very Large Scale Integration (VLSI) designs, or Very Very Large Scale if you like counting the letter V when talking, are possible due to low power dissipation as well as other factors. Go to any concert, show, or basement band practice, and you’ll find someone recording a bootleg. While these live recordings are sometimes fairly high quality, bootlegs recorded with a cell phone usually sound terrible. The guys over at Open Music Labs have a great solution to these poor quality recordings that only needs a few dollars worth of parts. The project is called bootlegMIC. It’s a simple modification of an electret microphone – the same type of mic found in cellphones and bluetooth headsets – that allows for some very high quality recording in very noisy environments. According to the open music labs wiki, the modification is as simple as cutting a few traces on the PCB in an electret mic and soldering on a cap and a few resistors. An electret mic contains a small JFET to amplify the signal coming from the microphone diaphragm; the specific JFET is selected by the manufacturer to ensure the microphone has the right gain and response. Usually these JFETs are chosen with the expectation of a relatively quiet environment, and trying to record a concert only results in a ton of distortion. By putting a resistor between the source of the JFET and ground of the microphone, it’s possible to reduce this distortion. The circuit is easy enough to solder deadbug style, and should work with most cellphones. The guys at Open Music Lab were able to get their mic working with an iPhone, but they’re still working on figuring out the Android mic input. There’s a great demo video showing the improvement in audio quality; you can check that out after the break. This week, with a little help from a Roomba, [Dino] built a guitar pickup and preamp that sounds marvelous. A pickup takes vibrations from the guitar and turns them into an electrical signal which can then be amplified and broadcast. He grabbed a long-dead Roomba which has slowly but surely been donating its organs for his weekly projects. 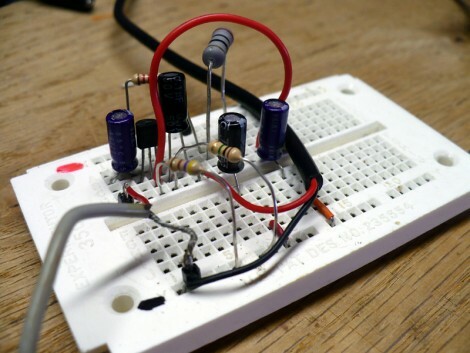 After plucking out a piezo element he grabbed a bag of Junction gate Field-Effect Transistors (JFET) and built a preamp circuit around one of them. JFETs operate in much the same way as MOSFETs (which we took a look at last week). [Dino’s] design adds a few resistors and capacitors to tune the gain and decouple the circuit from the input and power rails. He epoxied the piezo element inside the guitar and connected leads between it and a jack mounted in the body. As always, he does an excellent job of explaining the concepts behind the design and outlining the build techniques that he used. We’ve embedded his video after the break. Who needs a Fluke high voltage detector when you’ve got one of these things? Actually, we still recommend a professional high voltage detector for serious work, but you’ve got to like this electric field detector that [Alessandro] recently put together. The detector works by using a JFET to detect the high impedance electric fields that are generated by high voltage lines. The JFET amplifies the signal while dropping the impedance in order to drive a pair of NPN transistors which are used as a threshold amplifier. Once the voltage hits 3V, an LED is lit, indicating the presence of high voltage near the detector’s probe. A wire-wrapped resistor does double-duty serving as the probe while providing a high impedance path to ground, ensuring that stray charge does not accumulate on the JFET’s gate, causing false readings. It’s a neat project, and something that can be constructed in no time, making it perfect for beginner electronics classes. Keep reading to see a quick video of the HV detector in action.